The best restaurants in Brisbane are not only food halls for face-stuffing and stomach-expanding pursuits. No, they're much, much more. The best restaurants in Brisbane also know that drinks—pre-dinner, post-dinner, during dinner…—can make or break a meal. They also know that waiting for a table is much more enjoyable with a glass in hand and a place to rest your kaboose. The answer is the restaurant bar. A place to knock a few back, that toes the line between out-and-out drinking destination, and a casual place to perch while your table's freeing up. While you won't be staying all night, your time here will colour your whole evening out, so choose your restaurant bar wisely. 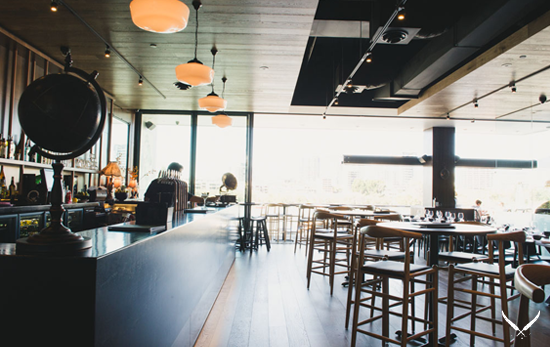 These are our picks of Brisbane's best restaurant bars. When you're going Italian you may as well embrace every facet of the culture, in particular the approach to drinking before and after a meal. And Bucci are masters of the well-timed aperitivo and digestivi. The bar in this bustling James Street restaurant is not only prime real estate for table nabbing; it's also in the perfect position for a quick drink in the afternoon sunshine, or a round with friends. The fact that they really know their way around an Aperol Spritz doesn't hurt either. If you can, ignore the fact that Gerard's Bistro have taken the restaurant bar concept to its delicious extreme with their new Gerard's Bar waiting pen/superb dining destination in its own right, because the Bistro itself is still home to one of Brisbane's best restaurant bars. The marker of any good restaurant bar is the feeling that once you're comfortably perched there—hopefully with something stiff on the rocks to soothe you—dinner comes as a pleasant surprise. The Gerard's Bistro's bar brings this feeling, big time. The ultimate slashie, Papa Jack's does it right when it comes to bars that are restaurants that are bars. Some of the best cocktails in town accompanied by yummo New Orlean's style food, you'll be forgiven for thinking you're in the Big Easy itself. Sup' on the most N'Awlins of nibbles, the po'boy and chicken wings, as well as some other more substantial Americana food from the supper menu, which is available until 1am on Fridays and Saturdays. Home to a mean Hurricane, they even have Sazerac on tap so you can party like it's carnival! Sake has to be one of the best restaurants in Brisbane to get your party started at. In true Japanese form, Sake not only have a pumping bar we'd happily sit at forever, but they also do bar food, so there's really no reason to budge. Sake's otsumami bar snacks menu and a bottle of sake are the makings of a great night out. 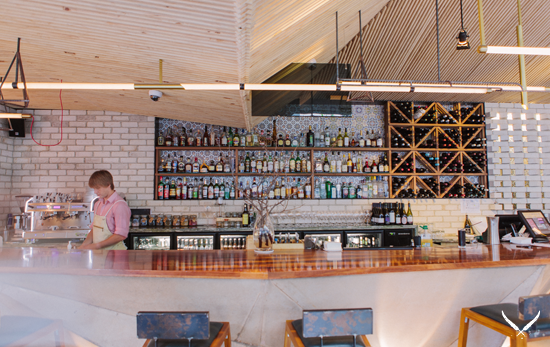 Residing in that happy medium between restaurant and bar sits South Brisbane's Hoo Ha Bar. A bistro that embraces eating and drinking with equal vigour, Hoo Ha's menus were made for relaxed dining, and their grazing menu in particular is the ideal accompaniment to a tipple from their extensive drinks list (those spiced chicken wings with palm sugar caramel need to be washed down with something). The casual vibe will have you stuck somewhere between drinks and dinner all night long, and you won't mind a bit. When line ups are inevitable, a restaurant bar becomes essential. Beccofino don't do bookings, and are unwaveringly popular. The result is a consistent throng of patrons waiting for their Italian fix on a weekend. They're more than happy to fix you a drink in the interim, and the pizzas passing by only add to the anticipation. Waiting for a steak doesn't need to be torture. While you wait for your party, why not start a little party of your own and let the gang at Blackbird fix you a cocktail at one of their many highly decorated bar spaces. Perched above the Brisbane CBD in a glass box, Public is as popular for an after-work session as it is for a sit-down dinner (and it's pretty popular for its dinners). This is definitely one Brisbane restaurant bar you can while away an evening at. The views of the CBD and Public's very shareable menu don't hurt, either. Ok, so we know pubs are already restaurant/bar hybrids, but Statler is a gastronomy pub, so we think it's fair to count their bar as an affable waiting area for the main event, rather than the star attraction. Before you stuff yourself silly with their epic pub-ilicious menu, take a mo' to have a pint or two. It'll make the move from bar to table that much sweeter. Views, cocktails, and some of Brisbane's best dumpling make Madame Wu a restaurant-bar all star. Handily placed near some of Brisbane's best night time haunts (cough, Fridays, cough), you'll have your stomach lined and your pre-game drinking done in one smart move. Fancy a tipple by the river before you get stuck into a perfectly grilled side of beef as big as your head? Yeah, we thought so. Portside's Belvedere know that drinking is half the fun, so their restaurant bar is as suitably civilised, with a deck to enjoy river views from, and a wine list as long as your arm. Have we missed your favourite Brisbane restaurant bar? Let us know in the comments below!